When Leo was 3-years-old, he was obsessed with dinosaurs. 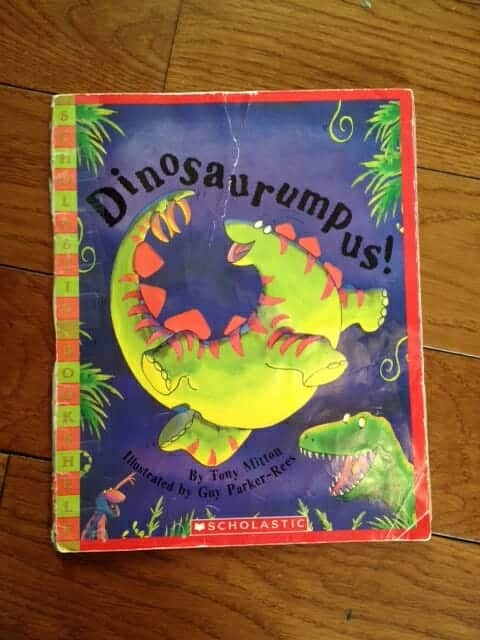 We had dinosaur books everywhere, he drew pictures of dinosaurs, he wrote books about dinosaurs. We read [easyazon_link identifier=”0545694809″ locale=”US” tag=”mylitpop-20″]Dinosaurumpus[/easyazon_link]! so many times that I still have it memorized. Our copy is worn and tattered, well-loved. Shake, shake, shudder… near the sludgy old swamp. Everybody’s doing the dinosaur romp. One night, when I went to tuck Leo in for the evening, I found him sobbing. He was afraid to fall asleep. Over the years, Leo has had a number of bedtime fears, so this was nothing to new to me. I sat down on his bed, rubbed his back, and asked him if he could tell me why. I wanted to get at what the fear was on this particular night so that we could tackle it and hopefully all get some rest. “Mumma,” he began, “the dinosaurs are extinct…” his voice trailed off and he succumbed to the tears once more. I unearthed my sweet boy from his twisted-tornado sheets and snuggled him in my arms. I held him there, squeezing his sad little body, and I waited for him to share more. And thus began our fear-of-death-and-extinction-phase. I wasn’t able to tackle the fear that night. It persisted for weeks. I mean, let’s be honest here, the kid had a point. There are so many gifted myths out there. So many. And, sadly, many of these myths are perpetuated in our public education system. Too many people mistakenly equate giftedness with high achievement. They assume that gifted children do not require special programming, that they will do fine if left to their own devices. Many people think that everything comes easily to gifted children, and assume they must be easy to parent. Because of this, gifted programming is often viewed as elitist and unfair to others- it’s seen as providing more for those who are already ahead. The concept of twice-exceptional children, children who are both gifted and learning disabled, is not well known- let alone understood– outside of the gifted community. I wish there was an easy way to increase the public’s understanding of gifted and twice-exceptional children. As an educator, gifted advocate, and mom to a profoundly gifted twice-exceptional son, I wish these myths were extinct. These myths have been around forever and overcoming them feels insurmountable at times. But I know that all change starts small. So, if I could just get people to understand just one thing about giftedness, it would be this: asynchronous development. One of the hallmarks of giftedness, asynchronous development refers to the uneven intellectual, social-emotional, and physical development that is so common among gifted children. Put simply, gifted children are often out-of-sync. While the average child develops relatively evenly, the gifted child can be many ages at once. And the more gifted the child- the further to the right on the bell curve- the more asynchronous the child may be. Asynchronous development often becomes less of an issue with time, although difficulties can persist into the teen years. A dinosaur-obsessed 3-year-old who is also terrified of mass human extinction is a perfect illustration of asynchronous development. Little Leo’s interest in dinosaurs was age-appropriate but his understanding of extinction and death was well beyond his years. Asynchronous development is the reason why Leo floundered in kindergarten. It is the reason why he did not want to return each day, and why he melted down every afternoon, once safely in our home. No one should be so misunderstood at five. Asynchronous development is why, over the summer at the age of six, Leo had a mature and heart-wrenching conversation with me about overcrowding and its impact on our local coyote population and yet, two days later, I had to under-arm him out of a robotics event because he was unable to wait in line or control his emotions. Leo is many ages at once. Chronologically, he will be seven in a few short months. Intellectually, he is more than twice his age. His social-emotional development, however, is probably that of a five-year-old. He is a funny, brilliant, creative, energetic, frustrating, demanding, and exhausting little person. He is a joy to raise, however, parenting him has been one of the greatest challenges of my life. Over the years, it has gotten easier, but it’s never been easy. 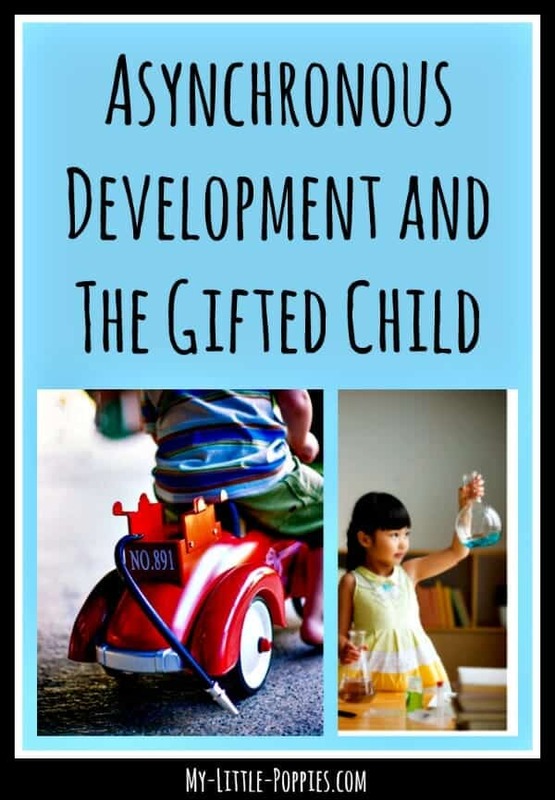 I truly believe that if more people understood the concept of asynchronous development, and began to think of giftedness as asynchrony, many of the gifted myths would be dispelled. Gifted students would no longer be equated with high achievers. People would realize that gifted children do not have it easy and that they are not easy to raise. The term twice-exceptional would make sense to more people. People would begin to understand that these asynchronous children have unique and special needs. Rather than being viewed as elitist, gifted support would be seen as a necessary part of a child’s development. Intellectually, they need to be with peers with whom they can relate (“Hey! You guys! Look at that right there- isn’t it beautiful? 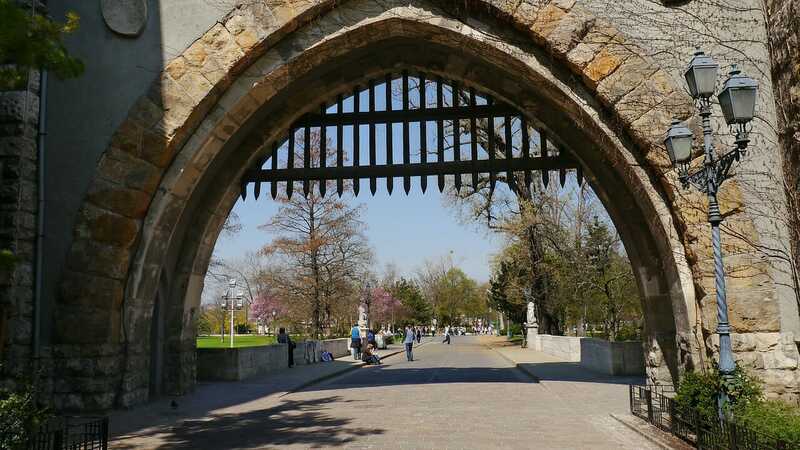 Doesn’t it look like a portcullis but with flowers?” is not a typical 5-year-old conversation), but they also need support in order to meet success in that environment. In the school setting, these students need to be challenged intellectually but with support and scaffolding for their unique social-emotional needs. I think that understanding asynchronous development is one step on the path to gifted myth extinction, but what about you? If you could get folks to understand just one thing, what would you pick? I’d also love to hear your stories of asynchronous development. These stories will help those new to the concept of asynchronous development to understand more fully. Please share your thoughts and stories here. Now, it’s your turn. Tell me: Are you parenting an asynchronous child? Share your story here. The truly creative mind in any field is no more than this: A human creature born abnormally, inhumanely sensitive. To him…a touch is a blow, a sound is a noise, a misfortune is a tragedy,a joy is an ecstasy, a friend is a lover, a lover is a god, and failure is death. Add to this cruelly delicate organism the overpowering necessity to create, create, create–so that without the creating of music or poetry or books or buildings or something of meaning, his very breath is cut off from him. He must create, must pour out creation. By some strange, unknown, inward urgency he is not really alive unless he is creating. Your post has put words to my unorganized thoughts. My daughter has been emotionally and verbally impressive since about 14 months, when she had 75 ASL signs to communicate. She went from sign language to an instant, huge vocabulary around that time. She is beyond her years in many ways, but she has struggled with visual learning from day one. It overwhelms her and reading is a huge struggle. Our world has changed since I realized she could be at drastically different levels at the same time. Twice-exceptional. Thank you! Oh my yes! Mass human extinction… My own fear of it as a small child was why I avoided dinosaurs with my son. But then he became interested in space and started worrying about the age of the sun and the expansion of the universe and if the sun disappeared, how long it would take before the earth spun out of orbit and we froze. Because at five, that is a very pressing concern. That, and his best friend telling him that he’s only her third best friend. That was the end of the world too. I so know and agree with what you’re saying! Love hearing these stories. I used to worry about war and poverty and the mistreatment of children and animals… oh wait, I still worry about all those things 🙂 Tough being sensitive when you’re little! 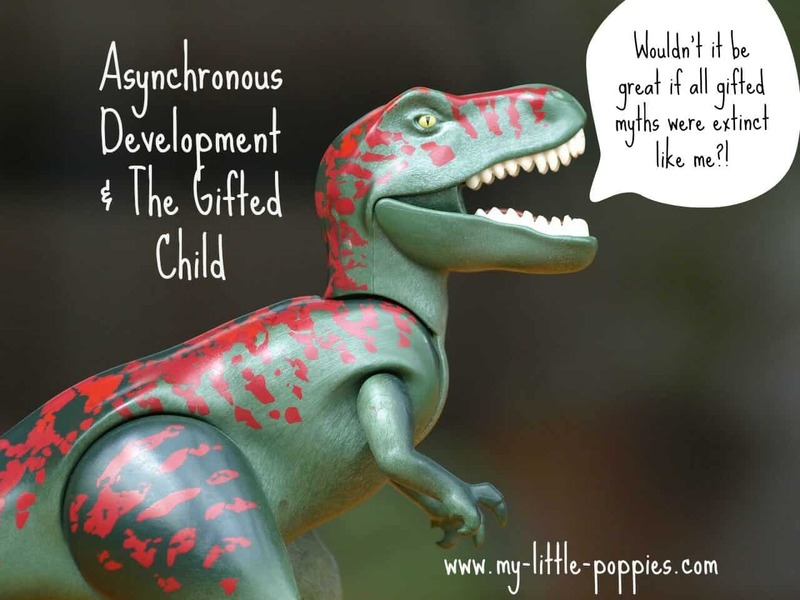 For some reason, when I read about asynchronous development, I thought that meant the child had to be developmentally BELOW in an area, while ahead in others. I didn’t realize it could be that a child is at-age in an area and then ABOVE in others. I was confused for my own son, thinking, “but he’s not behind emotionally, he’s his own age”. A good ah-ha moment for me. Thanks! The one thing- that my 4 yo gifted girl has made a social study of people. Don’t try to lie – she will read you and TAKE YOU DOWN. This means she also knows when people are giving her a subtle slight and exactly how to be “cool enough” to avoid such things. Her observant nature and her desire to fit in (already 1 year accelerated), mean that she purposefully regresses to the mean. Already at 4, I am concerned about the liklihood of her becoming a gifted girl statistic: the self conscious under-achiever. Chalis, Your daughter sounds like my five year old daughter. I always say she could be an eye witness or a psychic. She notices EVERYTHING, including how others are feeling at any given moment. She doesn’t say much but boy oh boy does she see it all. This is why I worry about K next year with her. She takes it in and does what’s “right” and will easily hide abilities so as not to make others feel badly. You and I can commiserate on that. Have you read about imposter syndrome?? Imposter syndrome is something that most girls and MANY women suffer with….I wish more women talked about it. I know some extremely high powered amazing women that will still back down even when they are right just on the off chance they aren’t good enough not right enough or just not enough enough.. it seriously seems like the smarter you are the more this affects you. I have been a ceritified professional at my job for years now and still worry that someone will realize I am not good enough for the job. So true, Vikki! It happens to so many of us. This whole post was very interesting, but this comment has been the thing that caught my attention the most. I’ve never heard of Imposter Syndrome, but boy does it sound familiar! Imposter Syndrome resonates with many gifted women! I’m a gifted girl statistic…which is weird because I didn’t realize it until working on my masters degree. I got bad grades in high school because I didn’t care to try. I didn’t realize then that i was subconsciously afraid of trying because I couldn’t afford to try and fail. If I failed, it had to be because I didn’t try. I think this fear still affects me today. Isn’t it funny how you realize it all later? Quite a journey! I feel the same way. I was not confident in high school and chose the arts because I, for some wild reason, thought I was incapable of excelling elsewhere. 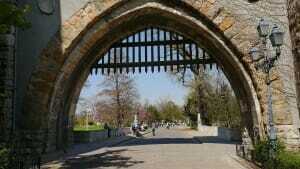 I think that fear affects me now in a different way as a mother, it is harder in interpersonal relationships. Your stories are wonderful and Leo sounds delightful! The one thing I wish teachers understood is that often times their perception of laziness is actually asynchronous development. It is so sad that if a child is not advanced across the board or a high achiever they are automatically labeled as lazy. My son’s dysgraphia and poor executive functioning were overwhelming for him when he was in a school setting. Add to that how he was often uninterested in the content being presented because it was either remedial or he had no idea how it related to him – teacher’s just assumed he was lazy. Thank you so much, Lisa. What you say about laziness is so true! I could see that happening to Leo in later grades. He certainly didn’t care for writing or doing tasks that aren’t high interest. Even here at home I see that. When he slumps down and refuses to participate I know I need to up my game a bit 🙂 Thank you for reading and sharing! When my C was 3, he asked daily if today was the day we were going to die. He was also memorizing long books verbatim with appropriate page turns. And had such social anxiety in big groups that he hid under a playset at camp roaring and throwing wood chips. Curious where you are in NE? We are in CT / likely moving to VT this summer. My three year old is memorizing the books now 🙂 Isn’t it amazing to watch? And Leo hid under the table at destination imagination and cried 😉 I love hearing these stories. We are all normal here! I’m in NH- message me where you are moving to – I’m planning on creating a parent group this year. Once I started understanding and reading what asynchronous development is it was like an amazing “a ha” moment in our house. Our almost 9 year old daughter is all over the place with her development. Through testing 2 summers ago, our suspicions were confirmed. She is indeed “Highly gifted”—-very far to the right on the bell curve. People just don’t understand what that means. My biggest pet peeve is when teachers say things like, “we know she is very bright” (well DUH!!!!! ), she’s beyond that, thanks. Thankfully every year seems to get better, but it is hard work raising her. We always knew there was something different about her when she spoke in full sentences at 18 months, could read fluently by age 4, etc… The biggest obstacle I feel she struggles with is her emotions and being reactive—-to me seems much younger than her chronological age. In fact her younger sister who will be five at the end of May (she is total even development) doesn’t react or throw fits like her older sister. It was when we would see how each girl dealt with things that we noticed how “out of sync” she is. We’re working on it. We embrace it and know that she is capable of great things. I just hope I can stay sane until she is an adult. Thanks for this post. Yes, learning about asynchronous development was an “ah ha moment for us too. My 9 year old is exquisitely sensitive so when something upsetting happens he is a five year old sobbing child. Today that is exactly what happened. I am so glad this blog exists to share the struggles and joys we all have. Thank you for the post and everyone who posted too. Your description of Leo (and what others have added in comments) is exactly what we were observing and trying to get people to consider. I have a newbie blogger question. This post is a fantastic resource to help people understand asynchronous development. I’ve been writing about AD for my dissertation lit review, but I’m not capturing it in a way that’s original or that’ll be personal. It won’t speak to people the way this post can. And other people have also done this subject justice on the interwebz. I have 2 other cool links in mind for sharing. If my post isn’t about AD, and is just mentioning the concept, is it acceptable to briefly give my thoughts but use links to posts like this to help people learn more about it? Thanks for your help. Hopefully it’s okay to link to this rather than take the time to explain AD in some other way that’ll undoubtedly be way less cool than what you’ve shared here. Thank you for reading! I’m a newbie blogger myself so I’m not sure I am the best person to ask about blog-etiquette, but I think as long as you link to a post and say who/where it came from, it should be fine. I’m honored that you would consider this post for your dissertation lit review. I’d love for you to link and share this post. I truly think folks would understand these kids more if they understood this concept. I was probably impolite on Twitter, too. I’ve only started really using it since January-ish and I’m fairly certain my daughter unfollowed some followers yesterday. Sigh. It’s a learning process, this blogging thing 🙂 Thanks for reading and for the positive feedback, Chris, and good luck with your work! Wow – I never would’ve guessed that you’re new to this! You’re doing a great job with it! Thanks for your help on sharing. I gave it a try the other day and used this post as the link in a sentence about asynchronous development. Later, I realized that I used two “poppies” blogs as links in one post, which is kind of funny. 🙂 Keep up the great work – I’m still so pleased to have found your blog and the rest of the gifted homeschooling community. If only I’d sought out other people when we began suddenly, unexpectedly homeschooling last year! What a shock it was. Whew. Oh, poor thing!! Perfect example of asynchronous development right there, Saskia! Yep. The kid had a point. Wonderfully written, as usual Caitie. Oh my gosh does this ever sound familiar. For my kids it was unanswerable questions. This is a plague among gifted kids — they don’t have the scaffolding to understand complex ideas but are already thinking about those complex ideas. Like my two-year-old’s question, “Do bees have intestines?” or my five-year-old’s insistence on asking questions about parallel universes and concepts beyond linear time. My son has an interesting birthday. It is one day after the school cut off. He started in preschool while he was still an infant. The school of course wanted to hold him in the infant room while his friends moved up to the toddler room because of where his birthday falls. He would have to be held back somewhere. But I insisted he move ahead. He was I thought above average and ahead of most of his older peers. His teacher always mentioned how he notices all of the little details even as a baby. He was very alert and even physically met milestones ahead of his older peers. So he moved up and was talking more than others. His new teacher said he was even helping the other kids with their language skills. He was very independent, had an excellent memory and learned very fast. He always seemed older to me. And I would comment on a regular basis about how confused I would get when parenting him. I still do! Because he was always ahead of his time cognitively and it didn’t match up with his emotional or behavioral regulation. I still struggle with this because what happens is I expect too much of him. I expect him to behave as an older child because of his cognitive abilities. I always thought he was pretty bright and it wasn’t until we moved to FL where they have a gifted program in the schools that I started really thinking about it. His last preschool teacher here in FL suggested that he be tested for the gifted program and she seriously thinks he will get in. I have some reservations but I think after doing some research on the traits and characteristics of gifted children I think I will get him tested. So I will finally know for sure. And then he can get help in school if he qualifies and hopefully won’t become discouraged and fall into the underachiever trap. Good for you for being on top of it all, Ashley! Such a great advocate for your little guy! Oh Cait, I could have written this same blog post (minus the dinosaurs, my daughter is into volcanoes). I had to choke back some tears because at 3 she is hitting some “difficult” developmental milestones that only my husband and I seem to understand (and thus, family and friends do not and make our lives as parents extra miserable with unwarranted comments and “suggestions”). I’ve known for a little over a year that she was “gifted,” and I feel like I’ve finally reached a point where I need to find “our people.” So, I found you on Facebook and now here – and I’m so thrilled! Thank you, thank you, thank you for writing and doing what you’re doing. I think it’s time to revive my blog as well and begin journaling this journey, too. And thank you for writing about asynchronous development. Yes – this is the one thing I wish people would understand. That my 3 year old uses words like “abomination” and “probiotic” and “germination” (and those are just the ones I heard this morning) but will have emotional meltdowns/tantrums over her milk not being warm enough. I feel like folks only see the latter part – “see, she’s still immature for her age” – and forget that she has full-on conversations with adults about topics like breastfeeding, constellations, and of course, volcanoes. Thank you so much for reaching out. I’m so glad you have such a firm grasp on your daughter’s asynchrony right now, at three. For what it’s worth, 3 was our most challenging age to date (KNOCKONWOOD, ha ha!). Are you in our Raising Poppies group on Facebook? MANY kindred spirits there to help and support on this journey! Hi there, I came across your article in my FB feed. It’s really interesting how much more is being shared on the gifted program than when I was a child…I was diagnosed & placed in a gifted program in grade 4 (testing year earlier) and stayed until grade 8. I walked away from that label many, many years ago, and only recently- since beginning homeschooling my own children (four years)-have I begun to realize that it is part of who I am…through homeschooling & educating myself on my own children’s strengths & weaknesses has “forced” me to face my own “issues”. I can still see how out of sync I am. I think way too much (most people say)!!! I take people at face value, and have had to learn to fluff many things in life off. Thanks for sharing!! It sounds like you are very supportive of your son & he is on the right track to realizing who he’s been created to be. My now twelve year old came to me at age four and asked, “Is ten 100,000’s the same as one million?” It was before breakfast and I had to stop and think about the answer. He was right. This child, who was multiplying LARGE numbers, was still in pull-ups. At three he was reading and I had to MAKE him learn how to jump. Now at twelve he is desperate to have his own science lab or to work in a real lab. His brain is there, his emotions and maturity are not. This sounds EXACTLY like my son. He said to me during supper one night, “Twenty dollars is two thousand pennies.” Or something like that…I can’t even remember the right answer! He was reading at 3, solving complex fractions in his head at 5. He will say things, during a tantrum, like, “This just tells me that you don’t understand anything about me!” It sounds like a teenager, but he has the emotions of a three year old. He is almost 7. I don’t know what to do next! I’m glad I stumbled upon this article because I’ve never heard of this before and it would’ve been so very helpful in understanding my gifted 8 year old! He was in Kind. and tested academically between 2nd and 4th gr. depending on the subject. We found out at about 18 mo. that he has Sensory Disorder and it was a challenge because he’d have a meltdown if other kids played too loudly too close to him, often covering his ears and exploding dramatically about how they were going to pop his eardrums and he’d be deaf forever! He had to wear sunglasses everywhere as well since lights bothered him, and we had to plan for extra time getting ready to leave the house since his sock Sean’s had to be in just the right soot in his toes, or he had to have a certain shirt or coat for the texture. This all improved with the help of his wonderful lre-school, but recently he’s been emotional – toddler like, but I figured it was just the sensory disorder. Reading about A.D. and learning gifted kids can be many different ages at once – helps me understand my son so much more! I’m an advocate for others learning more as well. We’ve been through “He’s lazy” stage when he was just 3 and wouldn’t read children’s books, he finally said he wanted “real” books (Factual History, Geography, and Science books)! He’s called a baby all the time by peers due to the explosive tantrums and a “touch is blow, a sound is noise,” etc. – what a wonderfully helpful comparrison of his daily world! Thank you so much!! Wow, I need to show this to my husband. I constantly have to remind people of my daughter’s age. She is 7 now bit this has been going on for a while. People expect her to be socially and emotionally where she is academically. In kindergarten she was tested and they found she was on the far right of the bell curve. Her teacher would tell me that she didn’t understand because she would have adult conversations about books and other topics but would struggle with taking tests (not the material she just didn’t want to do it) as well as some other things. She struggles a lot with finding friends or I should say keeping them. She makes friends instantly bit she has told me that after a while they get annoyed by her and don’t want to play anymore. I have a hard time helping her find a balance. 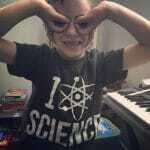 At 4yrs old she cried because I told her I could not get a microscope strong enough to see atoms. Oh, Kat. You are not alone! Are you on FB? Please join our Raising Poppies group. You will find so many kindred spirits there! My 3 year old “confessed” last night that she didn’t want to be an astro-micro-biologist anymore because she is scared of the dark and would be very lonely in space. She sorrowfully said maybe she’ll have to be “just a regular biologist.” This asynchronous child so frequently makes me laugh and cry in tandem. Wow, I could have written this article! My son will be 8 on July 4. Brings tears to my eyes knowing that I am not alone! Thank You! We aren’t alone, Shara! If you are on FB, please join Raising Poppies. You’ll find kindred spirits there! Thank you for this post! I think it is going to help me understand my son a little better. He just turned 6 and has graduated from Kindergarten. He reads on a 6th grade level and has that level of vocabulary, but emotionally he is somewhere in the 3-4 range. He has meltdowns that rival those of my 2 year old and has issues of what is appropriate behavior most of the time. He did well academically in school this year, but is so far behind socially I sometimes wonder what the coming years are going to be like for him. He actually loves school and being around his peers, but they think he is weird and pretty much avoids him; he just doesn’t realize it yet. I am toying with the thought of homeschooling him; I am trying to be open to what is best for him and our family at any given time. I love your blog. You are EXACTLY where I was two years ago. Big hugs to you because I remember feeling so conflicted. You will make the right choice for him- you know him best. And, whatever choice you DO make, you can always change it. Nothing is permanent. If you do decide to homeschool, I wrote a post for you this week <3 You've got this! Thank you for this. I work in the public school system, and have 2 gifted children. Neither fit neatly into the “boxes” we like to use to categorize and instruct kids. My asynchronistic examples: older child: On the gifted side, he currently has a lexile level of 1200+ at 11 years old, is highly analytical, very creative and artistic. Yet, he struggles with organization, being able to inhibit stimuli, and has a low average processing speed. In layman’s terms, he takes in everything, filters out nothing, takes a very long time to complete many things but when they are complete, they are impeccable. Sometimes his need for perfection and struggles with organization converge so progress comes to a screeching halt. He basically has the creative and analytical abilities of a Senior in High school with the organizational abilities of a 3rd grader as a 5th grader. We have nights where this leads to him curled up on the couch, crying because a simple homework assignment isn’t so simple for him. Younger Son: He thinks deeply about everything and his emotional rainbow is neon, where as others’ may be simply pastel or perhaps primary colors. When he gets a mosquito bite, he immediately fears that he’s contracted the zika virus because it’s carried by mosquitos and since global warming has occurred, a mosquito borne illness that would have stayed in the tropical region in an earlier time now could travel to our state because of the average temperature increase etc. We try to avoid news stations with information like this because of his worries, but he absorbs information from all sources, all the time, so it’s not avoidable. He understands global implications much more than other 9 year olds, and yet he still fears the bogey man like a young child; it just so happens that his bogey man is much more real. The myth I’d like to dispel is that having kids who are gifted doesn’t make things easy…for them as kids, or me as their Mom. THEY are a gift because they are mine, but Easy is not synonymous with gifted. I love all of this, Misty, but the part about your son’s emotional rainbow being “neon” really hit home. YES. I get it. We have those BIG worries, too. I’ve written about them here, on Year Round Homeschooling, and Simple Homeschool. Please know you are not alone! Caitlyn, where were you 32 years ago–oh that’s right! Probably not born! I have a son that experienced what I now know is Asynchronous Development. We knew he was gifted early on. He rewired the pump to my well at 2 years old while his daddy napped. He asked his pediatrician when there would be a cure for AIDS during his three year old checkup. Because there was no diagnosis like this at that time, he struggled tremendously. He was in a gifted program and remedial reading the same year. He was later diagnosed with dysgraphia as well. He is a wonderful, happy and successful man with two beautiful sons but the road has been a tough one. Despite years of counseling, at 16 he got involved and addicted tp drugs when his grandmother passed away. She wos his hero. He had a stint in rehab that fortunately was successful. He got his GED and never looked back. I am so proud of him. But I wish that I knew then what I know now. I wish that people understood emotional and social development of children. Gifted does not mean 1. Gifted in all areas 2. All children are gifted… Genius.. Armstrong and 3. Just because my kids are gifted in many areas, they struggle as we all do. They will toss a 3 year old tantrum, and later they will tell you the reason pi is not actually pi. I guess I wish I could thank God that I homeschool… And can… And hand every person they meet a book on child brain development and brain theory. Perhaps one on the genius of every child. We call them exceptional needs kids at NYU … That means the special needs kids and the gifted. We need to redefine our terminology. My teen might talk to you for hours about Ancient Greek lit, but hen she might be unable to overcome her feelings of social anxiety. I guess I just pray that folks stop judging, and start appreciating the beautiful garden of wildflowers that are our kids. Don’t box them in… Or pigeon hole them. Love and understand them.. Learn about you thru them. Wow what an eye opener. My son turned 3 in August and has exceptional maths and reading skills. His speech and emotional maturity is age appropriate however which causes him so many problems. He just isnt able to communicate everything he understands to us so gets so frustrated. Intellectually Hes way ahead of his peers so has little in common with them so is often classed as a loner or the odd one out. It is so hard when the people around you can’t understand your kid, it’s great to find somewhere that does! Loved this blog post. My son sounds similar. At age 3 and 4 he had a huge interest in dinosaurs, and geography. Not your usual, he would know dinosaurs I couldn’t pronounce and tell you what the capital and flag looked like for any country in the world. He would study maps and flag books. Yet at age 6 he still struggles to swing on a swing by himself while his 3 year old sister does it. He just can’t seem to get the rhythm down. He also struggles socially. He does fine with family and close friends but is pretty much mute to people he doesn’t know. We homeschool and he has so many social opportunities, we’re with our homeschool group 3 days a week but he doesn’t have an interest in having any friends. Just plays with his sisters and stays close to me. I just don’t think he’s ready to have a friend abc. E a friend yet. Hopefully one day that will come. Sounds like my guy! Kristine, if you haven’t already be sure to check out Raising Poppies on Facebook. It is a safe group that is closed (so your friends can’t see your posts unless you are in there) for parents of kids like ours. You’ll find kindred spirits! There are other people out there having these same mind-boggling conversations with their littles?! The theological conversations my daughter has… The need to know how everything works… I mean, this kid told her daddy she wanted to cut him open to see how he worked at age 4. (We opted for rabbit dissection and A&P books instead!) The problems we encounter sending her to church functions because people can’t cope with her questions… And the constant drawing and writing… Everywhere! We took her out of special needs preschool and discovered she had been required to write her first name 6 times each class. She was writing her full name on everything at home, and also labeling Mommy’s desk, her sister & brother’s toys, her daddy’s books… If it held still, it had a name on it. No wonder she was bored! And her test results were off the charts on either side. She was either 99% or <1%… There was no in-between. And she has no friends… We're a community of farm kids; no one understands her. Does she have the David Macaulay books? If not, she would LOVE them! This could explain many things with our seven year old that is just about to finish kindy. A real eye opener. Thankyou for your thoughts. I’m so happy it helped, Lisa. Be sure to join Raising Poppies if you are on Facebook! with my now-7- year old. I have recognized the past two years that he brings me joy like no other, however, he is also the most challenging person for me to be around at times. He has amazing emotional intelligence, verbal skills, and unbelievable insight, yet not being able to handle or process the weight of what he feels leads to frequent outbursts and exhausted parents. He has just been diagnosed with learning disabilities relating to reading/ writing and I have no doubt he is gifted. I’ve always said he’ll never be in want of friends because he’s got at least 1,000 in his head – referring to the constant scenarios he has in his head. He is affectionate, lovable, happy, active, and draining in that emotional way that is so much worse than the physical. Thank you for the new 2E perspective! Makes so much sense. Kristen, are you in our Raising Poppies group on FB? It will help! There are no words to convey what I am feeling right now, reading your words. I cannot imagine what your family is going through right now. I am sending thoughts and prayers and I hope that you have a support network in place to help you during this time. I am holding you in my heart. This is a great article. Thank you! My kids are such fun and interesting little people, but they sure aren’t easy to parent! Another thing I wish more people understood about gifted kids is that many of them have sensory issues which might make them seem out of control or just annoying. My 10 year old comes home from school all out of sorts (and she’s even in a self-contained gifted class with a teacher who understands her) and I have to remember that she hasn’t gotten enough sensory input over the past 7 hours. It takes a lot of patience (which I don’t naturally possess) to deal with her behavior. I agree! I have one of those sensory kiddos, too. I am a gifted adult who as a child although I did many things WAY above grade level, struggled with math( discalculia and boredom at the same time:), as well as with some executive functioning and social skills. I was often perceived as lazy and uncooperative. Sadly, my parents never really understood my asynchronous nature. It is amazing to know that I am not alone and your articles ring true. Way to go on advocating so well for gifted and 2E people! Oh, I am so glad to read this. Thank you so much for your kind words! We seem to be past most of the asynchronous problems with my 9 year old. He almost got kicked out of preschool because he wasn’t completely potty trained but was reading chapter books and could do 2 digit addition and subtraction in his head (however they would do NOTHING for him academically). It was obvious to me that he was gifted from a young age but I’m not sure about my 6 year old daughter. She does well academically, maybe one year ahead, …but emotionally!! I almost called a psychologist because for weeks she would randomly burst into tears thinking what if she had been born during the time of segregation and she married a black man and her kids had to go to ripped up schools? She said, “I’m NEVER going to feel better about this!” And then made me get rid of a book about Mother Teresa because she couldn’t handle the living conditions of the people she was helping. Lots of fears and worries. I don’t know what to do with her! Aw, I can relate to so much of what you wrote. Are you on FB? Our Raising Poppies group is a fantastic community- you’ll find so many kindred spirits there! Thanks for this very enlightening article. My son has always been ahead, especially with maths and scientific concepts. By 4 he was able to understand abstract ideas and do multiplication and division in his head, and by 6 he loved nothing better than to get up early so he could watch a documentary about earth, the solar system, dinosaurs or anything else he could get his hands on. He struggled with learning to read and avoided it for fear of failure. But now at 7 he has a stack of books next to his bed suitable for 9 years plus and loves to read before going to sleep at night. The feedback from the school often relates to him being behaviorally immature, and until now I couldn’t understand it. I understand now that he is developing asynchronously and also has the fear of failure in the mix which I think holds him back at times. My son is a sophomore in high school. I wish I had know when he was two years old about asynchronous development. At that time he was thought to be developmentally delayed because he had not started to talk yet. He had very slow speech development and social development. He also did not like to be read to and was always on the move. It was emotionally and physically exhausting as a parent. As he approached 3rd grade, it became apparent that he had an ability for math and numbers. His intellectual abilities, it seemed, surged while emotional and social abilities still lagged far behind. As eye witness to his development, I wish I had had more support during the process – and even now, I still am in flux as to know how to proceed. I wish I could find a parent that has navigated this whole process to help me through the teenage portion of such unusual development. He currently needs only to study a text book of calculus or physics in the summer- without instruction- to completely be able to understand and test at a 5 on the AP tests given to assess understanding of a subject. But still I wonder about the difficulty of parenting other aspects of my teenage son. Will the asynchronous development ever level out? Are there any parents of adult children out there able to help reassure and help answer this question? Yes to this. I’m new, so it’s good to read it’s not just us. Thanks! About two years ago, our then 4.5 year old was reduced to full body tremors and tears at bedtime. Why? “Dad… in a few billion years, our sun is going to turn into a white dwarf star! Where will we find another sun? How will we grow food? …” I was finally able to calm him down by explaining that, just like we don’t have to worry about putting our shoes on for tomorrow morning, because we have plenty of time before we need to put shoes on, we have plenty of time to find a new sun. Thank you for describing what we have long know about our son without being able to express (he has also been diagnosed with sensory processing disorder, but that’s only part of it.) Looking forward to exploring more on the asynchronous growth topic. I’m also an educator and will be spreading the word in my district. Thank you, thank you, thank you. I have so much guilt about not understanding this about my eldest child, about not understanding it about myself. I had that kind of development, but even now, I’m treated as having had anxiety and OCD from a very young age. I’ve been operating on the assumption that my son, unfortunately, inherited those labeled conditions from me. But your post describes him perfectly… describes us perfectly. 10 years after his dinosaur obsession and we still can’t talk about space in science class because he flashes back to his 4 year old self in a state of panic. Approaching high school, and he is so smart, but unmotivated. He’s so responsible, but has trouble keeping his temper in perspective. Now I see it: different ages all at once. So glad I read this. Saving, and processing. Any advice for how to unlock his potential? oh my gosh this article made me sob. I had never heard of this issue. this is my daughter. she is 8 and does the math worksheets she brings home in like one minute without writing the equations down and completes the packet that is supposed to take a week in about 10 minutes. She told me yesterday that the prize inside the cereal box was just a mass marketing scheme and proceeded to tell me how the economics of mass marketing work. however, she still has melt downs typical of a 3 year old when something comes along that she doesn’t understand whether its why someone gets two turns in a row in a game or if she does a multiplication problem incorrectly in her head. we have been seeking out resources to help her. we had a school social worker tell us she was autistic but it just didn’t make sense to me, as she was missing so many of the diagnostic characteristics. thank you for writing this I think it will really help us to know our sweet girl better. who can help us with dealing with the school? can a school psych dx this? we want to do an eval but we want to end up with the right information. . .
I’m SO glad I found you and Kara! I started homeschooling my 10 year old son six weeks ago and you two ( and by extension, Julie of Brave Writer) are my life rafts! I feel so incredibly lucky to have stumbled upon you all so early in this journey. My son is twice exceptional, gifted and dyslexic. We decided to homeschool 72 hours before the first day of public school because of so many factors, but starting with the fact that his school did not want to hear about our dyslexia concerns last year because his language arts grade was a B and he passed state reading exams the year before. Basically his giftedness was working against us because, hey, he’s not failing, he can’t be having THAT much trouble, right?! The school psychologist wanted to chalk it up to him being a “typical” nine year old boy who just isn’t crazy about reading and writing. His gifted teacher, who is AMAZING, sees my son for who he is, both intellectually and emotionally, knows his strengths and his struggles, had also shared my concerns but she was ignored by the classroom teacher and psychologist as well. We finally had to pay for private testing and had it confirmed that he is dyslexic. I’m so glad we decided to homeschool and that my son finally was on board with it I’d floated the idea out there for a few years but he always balked at the idea of not seeing friends during the day. This year he finally realized that with the current school climate we have, with kids on iPads or doing worksheets, where we as parents had to push for A LAW to get our kids a measly 20 minutes of recess a day, and where lunch time turns into a “no talking” lunch most days, how much real interaction was he getting with his friends during the day? Now he has more control over his learning, I get to help him with his dyslexia, and he still gets to see his gifted teacher & classmates for an hour each day. He’s SO much happier, our home feels so much more relaxed, even as we are flying by the seat of our pants figuring this all out! This is a major life change for us, and I’m having to put plans for my websites on hold for now, but I wouldn’t trade it for anything. I don’t have words to explain how must this resonated with me. I have been struggling feeling like I was being ‘elitist’ or overbearing because I forced an IEE for my four year old. I knew from an early age he was advance intellectually, but goodness the social and emotional piece is so difficult for him! Seriously, how many four and a half year old’s constantly say things like ‘Mom, the center of the solar system is making me squint.’ I just happened upon your site today, kismet! So happy you found us, Megan! You are NOT alone!